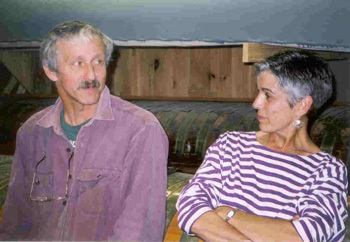 Canoes are built to special order and the backlog is often more than a year. A $500 deposit reserves a spot on the schedule, with another $1,000 due when the canoe is started. 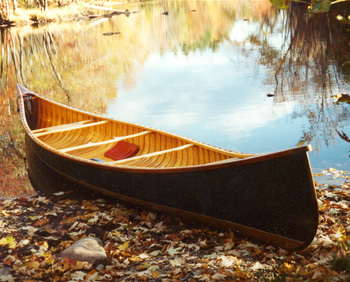 The remainder is due when the canoe is completed. Owners frequently enjoy picking up their canoes, and this scenic region of Central Maine offers many possibilities for the first launching. If the distance is too great or it is otherwise inconvenient to pick up, shipping can usually be arranged at a reasonable rate to any spot in North America. There is a $100 packaging charge for preparing the canoe for transport. The actual freight bill is assessed after the canoe's safe arrival. Monday - Friday, 8:00am - 5:00pm or by appointment. Let me tell you that that sweet little canoe is 50 pounds of pure paddling pleasure! Loaded with me and my gear (about 90 pounds worth), I had 7 inches of freeboard, and a nice slightly bow-light trim. With the load, she was incredibly stable, and heeled over to the paddle side (I really am a Bill Mason wannabe! ), she was fast, tracked straight as an arrow, and turned on a thought. For the riffles around Big Island, by kneeling behind the center thwart I had perfect bow-heavy trim. Actually, the riffles were really high, so I was able to pretend it was real whitewater and eddy out, ferry, etc. Pure fun!! !